Officials caution people not to drive down barricaded roads and to be cautious of any standing water. What seems like a small puddle can escalate into a raging current within seconds. The tragedy happened Sunday in Dallas, North Carolina, which is about 240 miles (385 kilometers) west of where Hurricane Florence made landfall Friday in Wrightsville Beach. Charlotte: Florence — which was once a hurricane and now is a tropical depression — is being blamed for at least 32 deaths in the Carolinas and Virginia. 25 were in North Carolina. Officials in those states are still worried about what’s to come because it’s still raining and rivers are swelling. 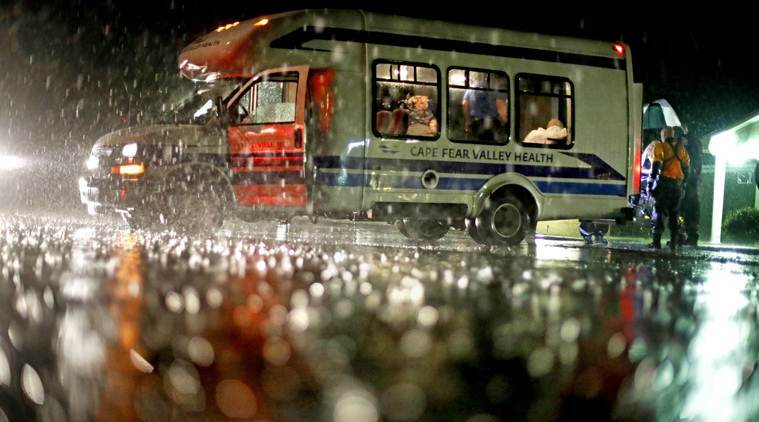 Several of the people who died in recent days were swept up in stormwaters. Three small children have been killed, two from falling trees. A 1-year-old boy was swept into floodwaters Sunday when the car his mother was driving came upon rushing water. The water from a nearby creek in Union County had risen quickly, and the current was swift. Dazia Lee told local media that she isn’t from the area and was unfamiliar with the roads. The water pushed her car off the road and left her stuck in a group of trees, authorities said. Lee was able to get Kaiden Lee-Welch out of the car, but the water caused her to lose her grip, she told Fox 46 WJZY. “I was holding his hand, trying to hold him, trying to pull him up,” she told the TV station. “I couldn’t hold on anymore and he let go.” She described him as “the sweetest boy.” Little Kaiden’s body was found Monday. A family member outside the home Monday said the mother was in the town of Monroe to return her son’s body to Charlotte. He said Lee was doing all right, but he teared up after a visitor spoke with him. Lee said that she would never intentionally put her baby in harm’s way. Lee said she is from Charlotte and said there was no barricade telling her about the dangerous situation ahead. “I saw people coming in and out, so that’s when I thought, I was about to detour but I stopped I saw the cars coming in and out… thought it was safe,” Lee told WCNC. Lee said she was bringing the baby to visit his great-grandmother. Police had initially reported that the mother went around the barricades before entering the dangerous road. They’d later tell her they heard only a gust of wind before one of those towering pines smashed into their home. Olen Gill, standing in the kitchen, was unharmed but couldn’t reach his wife and baby. Tammy Gill, who told her daughter she had just settled on the couch to feed Kade, couldn’t move. Both mother and child were trapped by the tree, a neighbour told the paper. Rescue workers had to cut the tree to free Tammy Gill. They tried to revive her infant, but doctors at a nearby hospital pronounced him dead. Leasha Murphy-Johnson and her 8-month-old son were the first fatalities reported from the storm. Murphy-Johnson, her husband Zac and their son were in bed Friday morning when a massive tree fell into their house in Wilmington, North Carolina. Authorities said it killed mother and baby and trapped Zac Johnson. Rescuers worked for hours with airbags, saws, heavy lifting and other specialized equipment to free him. When rescuers realized there was nothing more they could do to save the mother and son, they knelt in a prayer circle in the driveway. Rhonda R. Hartley, 30, died early Sunday after driving a pickup truck into standing water near Gilbert, South Carolina, losing control and hitting a tree, according to the South Carolina Department of Public Safety. Jeffrey B. Youngren 42, of Elgin, South Carolina, also died Sunday when a pickup truck hit a bridge piling in Kershaw County, said Coroner David West, who added that weather “played a big part” in the death. Michael Dalton Prince, 23, died Sunday after the truck he was riding in lost control on a flooded two-lane road in Georgetown County, South Carolina, said Coroner Kenny Johnson. The driver and another passenger escaped after the truck landed upside down in a flooded ditch.